Pop-punk shows can get rowdy sometimes, especially if the audience does a lot of crowd-surfing. Sometimes during said crowd-surfing, a fan ends up onstage. But their stay is brief — meaning that they’ll jump right back into the crowd in a second or two. But that was decidedly not the case for a female fan at a Story So Far show last Sunday night at Toronto’s Mod Club Theatre. 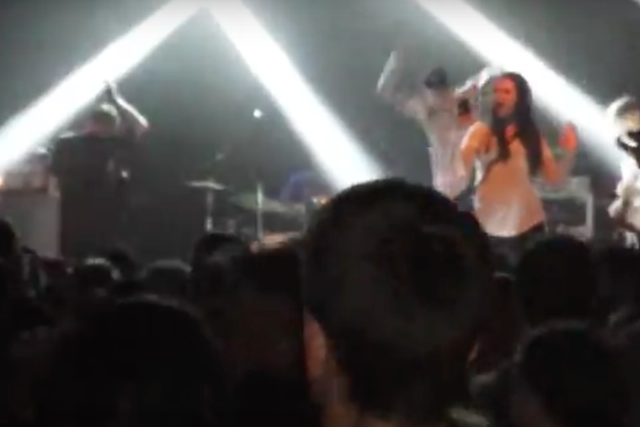 As you can see in the fan-shot video below, an overzealous fan got up onstage during the Story So Far’s show to take a selfie. Note that she was not facing the band, which only makes what happens next worse (not to mention a lot more dangerous). Lead singer Parker Cannon took it upon himself to literally kick the girl offstage, causing her to fall face-first into the crowd. Look, no one likes unauthorized selfie-takers. In fact, selfie-taking in general is a pretty obnoxious move. But to kick them square in the back from a raised-off-the-ground platform… Well, that’s just begging for a lawsuit. Watch it go down (no pun intended) below.